Characterized by a progressive decline in voluntary movement, Parkinson’s Disease is the second most prevalent neurodegenerative disease worldwide and the most common human movement disorder. The closest pathological correlate to loss of motor function is Lewy body formation, resulting from intercellular deposition of protein aggregates, the primary structural component of which is a-synuclein (a-syn). Two general categories of cellular aberrations have been identified in Parkinson’s Disease neurons. The first involves protein misfolding, aggregation and proteostasis. The second centers on mitochondrial damage and oxidative/nitrosative stress. A major obstacle in the Parkinson’s Disease field has been the identification of key cellular targets or pathways that connect these cellular dysfunctions. The Ryan lab has capitalized on recent advances in hiPSC technology that allowed for the development of a patient derived stem cell models of Parkinson’s Disease for mechanistic study. Using these model systems, we aim to gain a better understanding of the molecular deficits that result in neuronal impairment by focusing on mitochondrial function and oxidative stress. As reservoirs for calcium ions that accumulate after neuronal firing and neurotransmission, mitochondria serve to maintain calcium homeostasis. Injured mitochondria release intracellular calcium, increasing free radical production (ROS/RNS), which in turn can result in loss of neuronal function and cell death. In neurons, mitochondria are remarkably dynamic, traveling along nerve processes as they distribute energy throughout the cell. 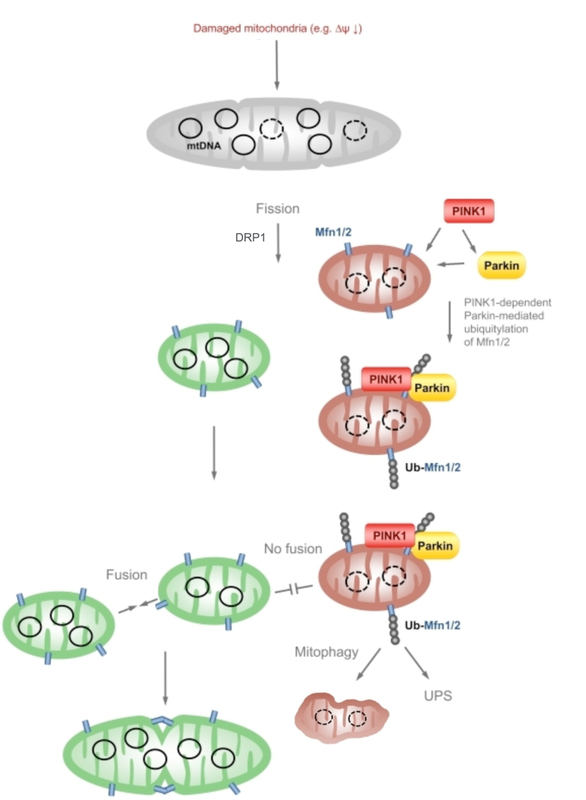 Mitochondrial dynamics are regulated by four highly interconnected processes; mitochondrial biogenesis, mitophagy, fission and fusion. Mitochondrial biogenesis is the process by which new mitochondria are generated and is largely regulated by several key transcription factors. Mitophagy on the other hand is the process by which mitochondria are degraded and is mediated by multiple signaling cascades involving proteosomal degradation and autophagosome formation. These two processes control the quality and overall content of mitochondria. Mitochondrial function is highly dependent on the processes of fission and fusion that allow mitochondrial DNA to be interchanged in order to maintain proper function or isolated through fragmentation of smaller damaged mitochondria. As such, all four processes are critically interdependent and must be interpreted in unison. To determine how ROS and RNS impacts on these processes in stem cell derived PD-neurons, the Ryan lab uses state of the art microscopy and mass spectrometry equipment. By performing a comprehensive analysis of mitochondrial dynamics (fission, fusion, transport) and temporal measurements of mitochondrial stress based second messengers (Ca2+, Nitric Oxide and O2-) combined with an analysis of redox-based modification to mitochondrial-machinery (Sulfenation, Nitration and S-nitrosylation), we will delineate the stress based signalling cascade activated in PD neurons. Our previous research endeavours have identified a pro-survival transcriptional network that is inhibited in Parkinson’s Disease neurons. The pathway hinges on functional activation of the transcriptional co-activator PGC-1α. PGC-1α is a master regulator of both mitochondrial biogenesis as well as mitochondrial respiration and functions in part through activation of NRF2. We have previously established that expression of PGC-1α itself is transcriptional inhibited by oxidative stress induced redox modifications in Parkinson’s Disease neurons. 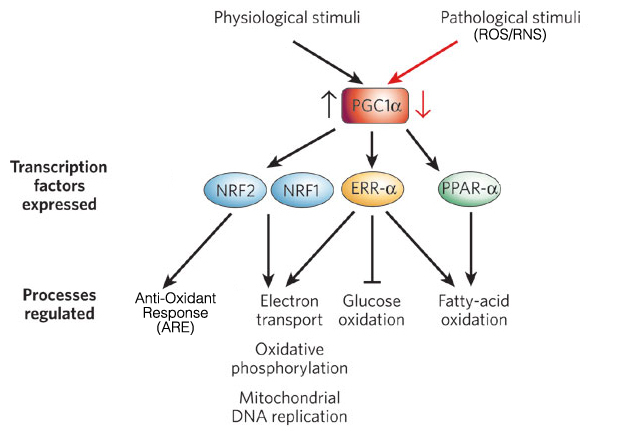 In addition to its role in the regulation of mitochondrial respiration, NRF2 activates the anti-oxidant response pathway upon nuclear translocation and binding to co-activators (such as PGC-1α). Thus, a combination of oxidative stress and impaired transcriptional activation of mitochondrial and antioxidant genes represents a major deficiency in PD. This research project will focus on this and related transcriptional pathways, whose inhibition impairs mitochondrial function in stem cell derived Parkinson’s Disease neurons, in an attempt to rescue the disease phenotype.